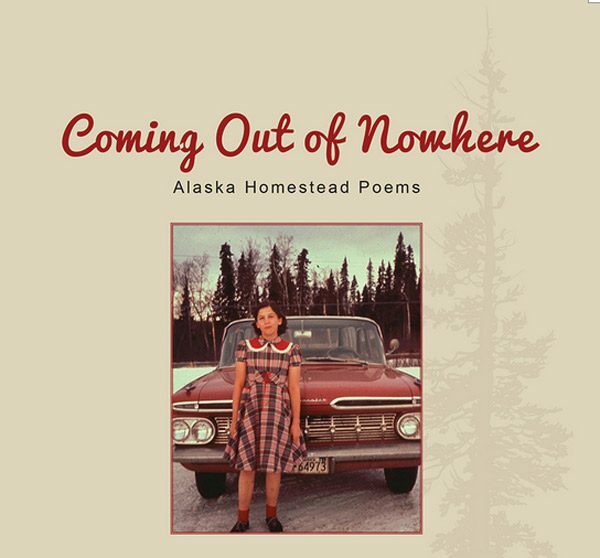 Book jacket for Linda Schandelmeier’s new book, “Coming Out of Nowhere, Alaska Homestead Poems.” She stands in front of her family’s new 1959 Chevy station wagon purchased with some of the receipts from selling part of the homestead. Her family—parents Nell and John, sister Jeanette, brother John and Linda—”proved up” on 160 acres of land just six miles from downtown Anchorage. Her father filed for the land in 1946. She describes it as “L-shaped along the east side of the Old Seward Highway with 120 acres north of O’Malley Road and 40 acres to the south.” Today that footprint still includes the Old Seward Highway, stretches south from East 100th across O’Malley Road and lands in a trendy shopping center complete with the seemingly modern necessities of a restaurant, cafe, fitness center and yogurt shop. Join us on the next Hometown Alaska to hear stories of homesteading in Anchorage. Linda will read some poems, paint a picture of local life back then, and offer the seasoned perspective of distance. Today, she lives in Fairbanks. LIVE: Monday, December 10, 2018 at 2:00 p.m.
REPEAT: Monday, December 10, 2018 at 8:00 p.m.